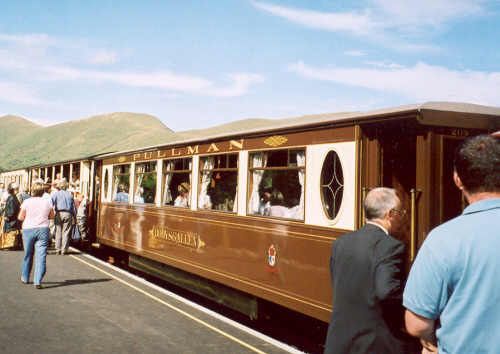 The Public Opening of the Welsh Highland Railway extension from Waunfawr to Rhyd Ddu on August 18th 2003. 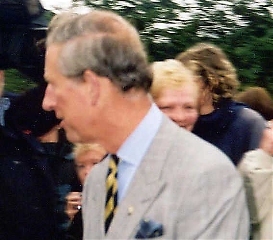 Earlier, on July 30th 2003, HRH The Prince of Wales travelled from Waunfawr to Snowdon Ranger on a replica of the first WHR train and from Snowdon Ranger to Rhyd Ddu on the footplate of the engine 'Prince'. All photographs by Noel Walley. 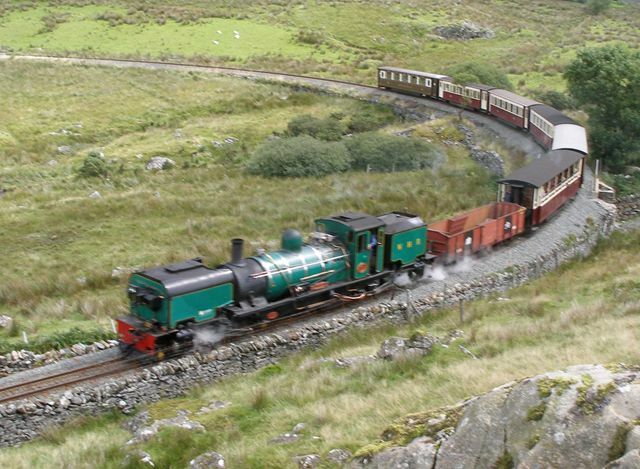 Photographs below taken travelling on the mid-day train from Rhyd Ddu on May 14th 2005. View from the train in the platform at Rhyd Ddu. In the foreground is Llyn y Gader at the head of Afon Gwyrfal. North of Rhyd Ddu the train decends the many curves to Snowdon Ranger at 1 in 40. Decending into the glacial valley of the Afon Gwyrfal with breathtaking views. Near Glan y Afon the valley broadens to form the reservoir Llyn Cwellyn. Mynydd Mawr dominates the view westwards from Snowdon Ranger. - seen against the backdrop of Castell Cidwm as the train approaches Betws Garmon. about to leave Waunfawr for Dinas and Caernarfon. Photographs below taken travelling on the afternoon train from Caernarfon on October 5th 2005. The Afon Gwyrfai between Dinas and Waunfawr. 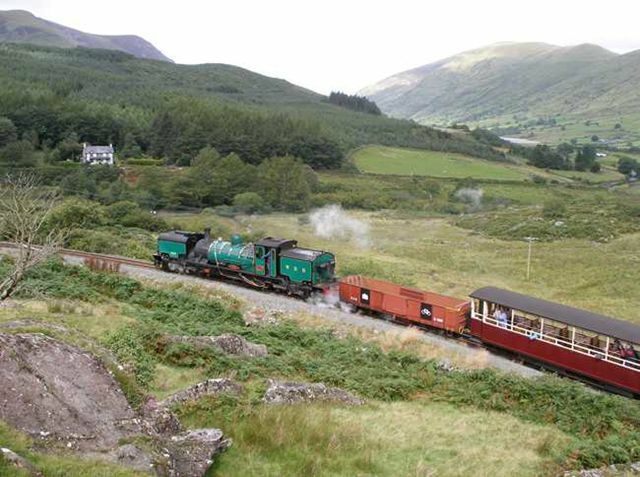 and on its first day in passenger service, entering Snowdon Ranger station on October 19th 2007.
they built their last Beyer Garratt, NG 143 for use on 2ft narrow gauge lines in South Africa. also at Waunfawr on a Caernarfon bound train on May 14th 2005.